Welcome to Adult Student.com! Are you returning to college? Never been before? We are here to assist you with your education progress. 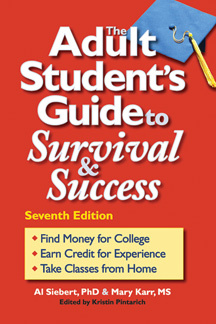 Our site is a companion to The Adult Student's Guide to Survival & Success, 7th edition (ASG), by Al Siebert and Mary Karr. The ASG is a student success book that shows how to handle the unique challenges faced by adult learners starting college. Realizing the growing importance of the internet in our workplaces, we have compiled this site as both a resource and an exercise. Throughout the site, you will find links to follow which will develop your familiarity with and skills using the internet. If you need some helpful internet tips right now, visit our internet help pages listed below. Below you will find the sections that are referred to specifically in the ASG. For a brief description of the contents of each section, please visit our student Sections page.